Social Media is a huge platform to meet the new peoples and share the stuff with other people. In nowadays Google+ is becoming a very popular Social Media platform to get real Google Plus followers and make or join the new Google Plus communities and gain something fresh.In this I’ll show you a method to get free Google Plus followers real and 100% working, but having good number followers on your Google Plus profiles make your profile more professional and attractive, this is not just one advantage of having good number of Google+ follower, you’ll have the chance to get maximum numbers of +1 to your Google+ post or any other post or link which will you share in your Google+ profile. Most of the bloggers or regular webmaster as well as regular users take the lots of benefits from Google+ to getting high numbers of engagement on their shared post and get more social signals to their posts which make their post to rank higher in Google, Bing, Yahoo, and other search engines. After reading the all above lines, now I’m sure that a question is comes in your mind that “how can I increase my Google Plus followers” right? If I’m right then you’re at right here and ready to go just read the whole post, and I’m sure this will help your increase your Google+ followers for free and very quickly. I’ve come up with this simple trick to get free Google+ real followers quickly. This method is also working on new Google+ interface which is fast and straightforward and also using this trick you’ll get new and true followers under your interest. You already read about how to increase G+ followers on other websites, but now in 2016 they aren’t longer work because Google has recently changed the interface of whole Google Plus and also remove the Circle Sharing features. But We’ve another method to increase real G+ follower just follow this guide; the trick is very simple. 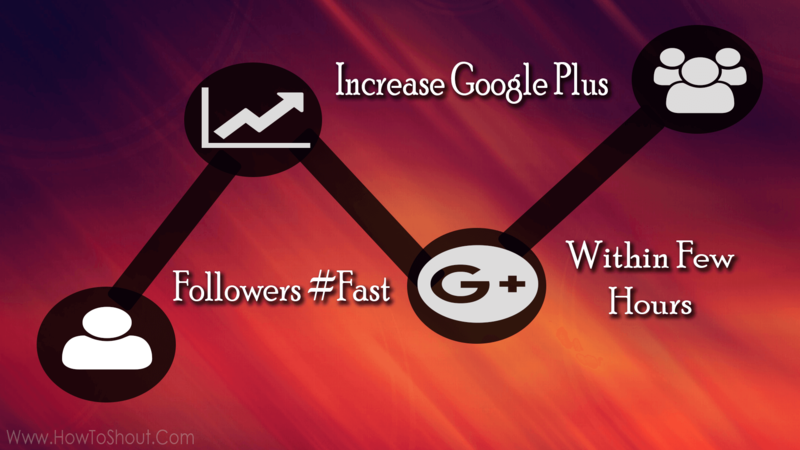 Without wasting your time let’s get ready to increase your Google+ followers, this guide will help you get a maximum number of followers daily, but it depends on you that how many peoples you have followed. Before following steps to increase follower, first make your Google+ profile attractive by adding an excellent profile picture, by adding beautiful cover and fill out all the information which will appear on About section of your G+ profile. So let’s follow below steps. Open Google+ and make sure you’ve done your profile complete and also there is no restriction on your G+ profile. Now search for your interest like I search for “Technology” or any other keyword. After searching, there you’ll see two sorting options Best of and Most recent, you’ve to choose Most recent sorting option. 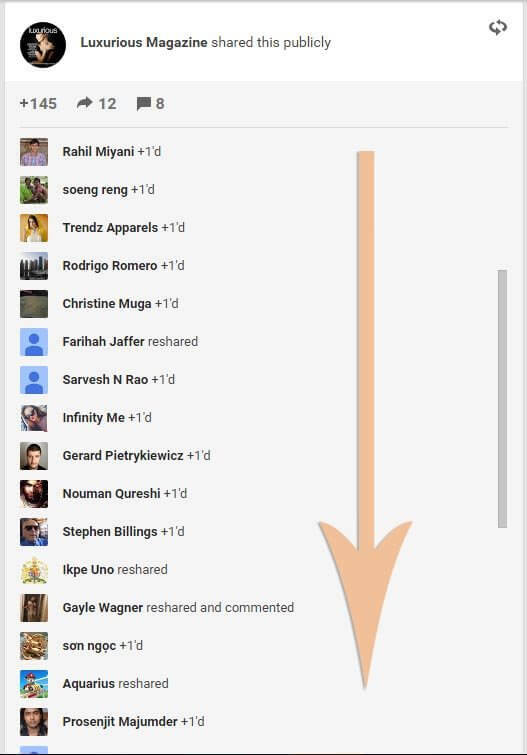 Now find a Google+ post in which so many user activities (like comments and +1s), just like below image. 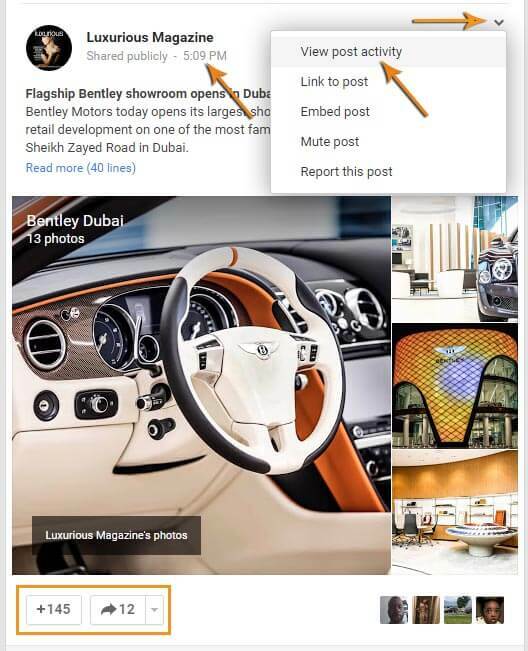 The most important thing only choose the those Google+ posts which are shared just a few hours ago like below image. After this, you need to click on the top right arrow and select the View post activity option; there you’ll see the list all users who are recently doing some activity on this post. Now your work is started, You have to start to follow the peoples and wait for few hours. Then you’ll start getting new, real and free Google Plus followers. After using this trick a few hours later, I started receiving the more Google+ notification which is almost I got new Google Plus followers below is the screenshot of proof. Use this method at the time of 8 PM or 9 PM because most of the Google+ users are active online at this time. It is the most simple technique to increase Google+ follower but yet working & useful, in this case, you only need to add a Google Plus Badge Widget on your blog or website at best place. Now you’re thinking about where ‘s the best place on my blog, I also have the answer to this confusion you simply use this Badget on your About Us page or you can use the Heatmaps to check which is most clickable place on your site or blog. It is also the most convenient method to increase the real and verified Google+ followers, on the internet, people can buy anything similarly you can also buy the targetted Google+ followers and grow your profile and authority. 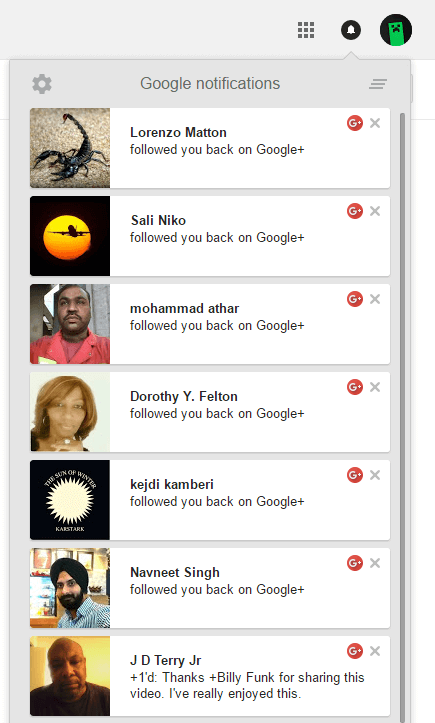 You can either use Fiverr or SEO Clerks to buy real Google Plus Followers. Yes, this method will help to gain not just real but also targeted followers too. Prajjwal Rajput good trick.but i have a problem when i search a topic but don’t show two sorting options Best of and Most recent. How many follow per day. First, you need to go the classic version of Google+ by clicking Revert Classic Google+ available at bottom-left corner. Follow maximum 10-15 peoples per day (not at instant). and waiting for your next post. Yes If you want to invest money in buying Googel+ followers then SEO Clerks and Fiverr are the best marketplaces. Thanks for your trick mr..
tanks for trick . usefull! Great tip Prajjwal…i was just sharing post in communities to get followers…but this tip will really help me to increase my followers…!! thanks buddy!!! Now share this post with your friends also. Prajwal – Detailed information provided. I go through your post and found that this is a great post you share here. Actually, I am searching for some ways by which I can improve my Google+ followers and here in this post my searching is over as I found very useful information in this post. This article is really helpful for me. Thank you for sharing this informative post with us and keep sharing new posts.